So, as a follow-up to my post about the books I've added to my to do list, I've decided that I ought to include some sort of summary or discussion about each one. 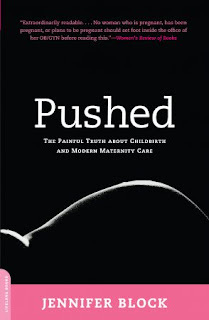 Today's is for Pushed: The Painful Truth about Childbirth and Modern Maternity Care by Jennifer Block. "Women are even beginning to deny normal birth to themselves: If 'normal' means being induced, immobilized by wires and tubes, sped up with drugs, all the while knowing that there's a good chance of surgery, well, might as well just cut to the chase, so to speak. 'Just give me a cesarean,' some are saying. And who can blame them?" Block's goal is to get women to be their own advocates and to be informed about how labor should progress. She blames the medical industry's penchant for turning medical advancements aimed at "treatment of abnormality" into "speeding up an ordering an unpredictable, at times tedious, process" for women being pushed into too-soon deliveries. She says that women are too often offered inductions, Pitocin to speed up in-progress labor, artificial rupture of the membranes, and even c-sections for convenience. She sees these practices as directly related to more tearing during delivery, a higher rate of c-sections (whether the patient wants one or not), and overall rushed, unhealthy deliveries. Clearly, Block is a natural birth advocate. She goes so far as to frequently cite sources who believe no "normal" (complication-free) pregnancy should end in a hospital. She also has a large section of the book devoted to cataloging the daily activities of midwives, some of whom practice underground because the states they are in have made their careers illegal. I enjoyed the read and agree (at least intellectually) with a lot of the conclusions and evidence. As for what I took from it to personally apply to my pregnancy and intended birth, I'm less clear. I like the idea of a natural birth, but I like a lot of ideas. I was in the room with my sister as her labor progressed (naturally, without any medication to speed it up), and she looked positively worn out before she asked for the epidural. (I left shortly after that, but I was there long enough to see her become much calmer). Even though the epidural provided her a much-needed relief, it also made her very--for lack of a better word--dopey. She also tore pretty badly during delivery, though I have no idea if that's connected to epidural use or not. At first, I thought for sure I'd get the epidural. Then, I did research and decided that I would try to do it without one. The thing that made me change my mind was reading about how delivering flat on one's back is about the least logical way to do it. This made a lot of sense to me. I grew up in the country and watched a lot of animals give birth; I've never seen one do it with their legs straight up in the air. As I read about walking around to help with labor pains, different positions to push, birthing balls, and water therapy, it sounded good. Plus, I really, really don't want to feel drugged out. But then I remembered my sister's face before the epidural, and she was only dialated to a 4 at the time. So, I'm still on the fence. As for Block's other concerns, I feel somewhat (perhaps naively) confident that I can be my own advocate in preventing early intervention. My doctor and the hospital I am using both strongly advocate natural birth. They provide birthing balls and two-person showers for laboring mothers. The hospital itself provided me a birth plan to fill out that included options about how much movement and control I wanted during the process. This could all, of course, be smoke and mirrors, but I feel comfortable there. In addition, my doctor's office is a combined practice, and the doctors share weekend and late night shifts. This means that I might not have my individual doctor present at delivery, but I feel like it also means that I'm less likely to be pressured to speed up a delivery to accommodate her schedule. This was useful to me, as I am 30 weeks pregnant and have just starting thinking about this kind of thing - how I'm going to cope with pain in labour without drugs especially (as that is my plan). I hadn't heard of a birthing ball and am about to look it up. Thanks! Patty Simkin offers the The Birth Companion book (or its titled to that effect) and a few free articles online. She goes through natural labor management techniques. I think you should read Molly's birth story, over at First the Egg. She had what most people would consider an extreme labor (over 50 hours!) at a birth center. She also has a lot of great pregnancy, birth, breastfeeding, and parenting resources. It sounds like you have a good hospital to birth at. What about after the baby is born? Do you they do immediate skin to skin? Will they routinely give the baby formula until your "milk comes in"? I know that I focused on the pregnancy and birth for far too long; kinda forget that it was only the first step! If you want to breastfeed I would consider attending a breastfeeding support group while pregnant, such as Le Leche League. You can observe women breastfeeding and the leaders are a great resource. Meghan: The hospital also seems very supportive of skin-to-skin contact and breastfeeding, and I am attending a hospital-sponsored seminar on breastfeeding. You're right, though; at the moment the birth itself is overwhelmingly consuming my thoughts, and what happens after is so important. Louise: Glad you found the post helpful. I found this book to be a good read. It did help me feel more committed to trying natural birth. It's just so hard to talk yourself up for an experience when you have no reference point for how it will feel or progress. You should consider getting a doula to support you during labor. I was not sure about the epidural either. In the end I decided to try and go without it, but with the door open in case I feel I really need it. I came to this decision with the help of my doula (and my husband), and it was reassuring to me that she would be there to help me make the final decision on the spot. In the end I didn't feel I needed an epidural and had a wonderful birth experience, which I attribute in part to the support of my doula. But of course I could have needed an epidural, so I think flexibility is important.